Sun-dried mud-brick was the very basic construction material in ancient Egypt, while pyramids, temples and tombs were built of stone - mostly limestone, sandstone and granite. Thus we can still admire well preserved architectural achievements of the ancient Egypt although they were constructed thousands of years ago. The pyramids built in the period of Old and Middle Kingdoms are the most famous architectural monuments of ancient Egypt and probably also of the ancient world. Pharaohs ordered construction of pyramids shortly after ascending to throne to complete it in their lifetime. Pyramids were built as tombs for pharaohs and for that reason it was crucial that they were finished before their death. The oldest Egyptian pyramid is the Step Pyramid of Djoser at Saqqara. It was built between 2630 BC and 2611 BC by prominent Egyptian architect Imhotep. The pyramid building reached its height with the Great Pyramid of Giza, also known as Pyramid of Cheops (Khufu). The Great Pyramid of Giza designated as one of the Seven Wonders of the World was being built for about 20 years and was completed in 2560 BC. Originally about 147 meters (482 feet) high pyramid was built of over 2,3 million limestone blocks each of which weighs from 2 to 15 tons. How exactly the Egyptian pyramids were constructed still remains unknown and there are many theories about Egyptian pyramid construction techniques. All the most plausible theories suggest that the constructors used some kind of a ramp to drag up the giant blocks. Some Egyptologists believe that a single, mile-long frontal ramp was used and was destroyed after the completion of the pyramid, while the others consider more probable a spiral ramp around the pyramid. However, all experts of ancient Egypt agree that construction of pyramids required enormous human labour force which did not consist of slaves like it was believed for a long time. The archeological finds discovered near the Giza Pyramid Complex imply that the pyramids were built by thousands of skilled workers who worked for a salary or as a form of tax payment. Pharaohs ceased to built pyramids as their burial sites in the period of the New Kingdom. Instead they had chosen to be buried in the Valley of the Kings on the west bank of the Nile near the Thebes. 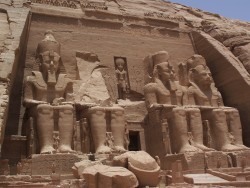 The royal tombs were cut deep into the rock but unfortunately, the majority of 62 tombs and chambers was robbed. However, English archeologist Howard Carter discovered the intact tomb of Pharaoh Tutankhamun in 1922. Tutankhamun’s mummy and treasures found in his tomb are today on display in the Egyptian Museum in Cairo. Magnificent temples and temple complexes are among the most splendid ancient Egyptian architectural monuments and attract millions of tourists to Egypt from all over the world each year. The most famous and notable are the Temple Complex of Karnak located near Luxor and dedicated to god Amon-Ra and the two massive rock temples Abu Simbel carved out of the mountainside during the reign of Ramses II.